Geek of All Trades » Titans on Track? I ran across this add in this week’s Earth 2: Society. (Yeah, I know. I’ll get caught up…) It’s for a 12 issue limited series called Titan Hunt. The thing is that it doesn’t seem very New 52. It seems that Convergence may be having an impact after all. I looked up online and the issue description reads as follows. I’m really liking the look of this. Especially given that I just dropped the current Teen Titans from my list, I’d love to get a good one, one linked to the pre-New 52 universe. I’d love to see all this pulled together. Will this lead to seeing a pre-New 52 Wally West? What about characters like Jericho, Red Star, Pantha, Wildebeast, Flamebird, and the original Joker’s Daughter. There were also characters like Chris King (How I’d love to see a real Dial H for Hero story!) and Captain Marvel Jr. who were associated with the group that could be fun to see pop up. I really hope we start seeing more of the pre-New 52 stuff start coming back. There was so much good stuff there that was lost. 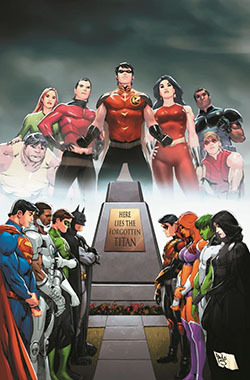 Of all of it, the Teen Titans are one of the things I’d love to see the most.